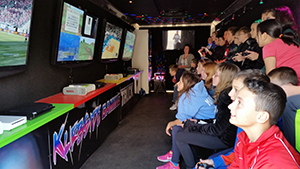 This gaming truck will be the hit of any birthday party, graduation party, private party, coporate event, school event, church picnic and grand opening events to name a few. 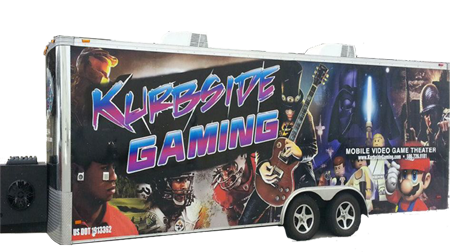 30 feet long Kurbside Video Game Truck. 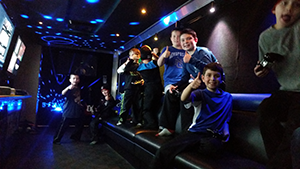 Accommodates up to 16 players at a time. Additional stadium style seating for spectators. Fully climate controlled luxurious limousine style interior with air conditioning and heat for year round entertainment featuring a huge gaming couch for the utmost in comfort. Unique LED ambient lighting throughout. 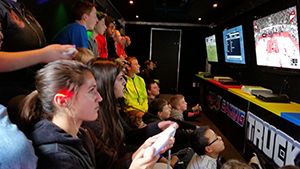 4 interior gaming stations with high definition huge flat screen 50" televisions. xbox 360, ps3, and wii gaming consoles with over 100 video game titles to choose from. Free game coach (ensures your event runs smoothly with appropriate game selection). Free usage of our extensive game library with over 100 titles to choose from.